Please visit http://hyenacart.com/kumfykozies/ to help a family in need by placing a bid or donating an item for auction…below is taken from Kumfy Kozies’ website where auctions are taking place to help benefit some personal friends of mine as they are currently living without an income as their small son is receiving Hospice care. After more than five years of dating, Leah and Mikey tied the knot in August of 2005. Shortly after, they decided they wanted to start a family, and after many months, they finally got their positive test. On February 25th, 2007, Andrew Lawrence was born. Leah and Mikey were overjoyed at their amazing little miracle, and thoroughly enjoyed every aspect of parenting their tiny bundle. Life for Andy since his diagnosis at 19-months-old has been difficult, to say the least. He is immuno-suppressed, and even the pain and fever from teething can put his brain into shock, causing life-threatening seizures. His body has rapidly declined over the last two years. He can no longer crawl or sit up unassisted, has very little spoken vocabulary (though it’s obvious he understands everything around him) and often has difficulty swallowing. He sees three therapists six times a week, and Leah left her job while he was young in order to stay home and devote her life to giving him the best possible care around the clock. Since Alper’s is such a rare condition, there are very few doctors that have ever even heard of it, much less know how to care for a child with the disease. Since January 2010, Andy has had a sudden decline in physical ability, and his seizure activity has been nearly constant. On June 23, 2010, Andy was unable to fully wake up from his nap. He seemed awake, but was stuck in a seizure state, that despite numerous doses of anti-convulsants, would not loose its grip on his body and mind. He was admitted to the local hospital in Central New York, then transferred to the Pediatric ICU at Upstate Galisano Children’s Hospital in Syracuse, NY, where he has been in a coma and on life-support since June 24th. 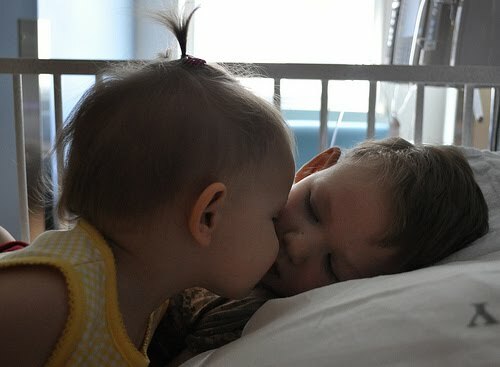 Andy’s little sister is staying with family near the hospital while his mommy and daddy keep constant vigil by his bedside, praying for a miracle for their little hero who the doctors say all the odds are against. While he has shown definite improvement, he still has not awakened, and the doctors feel that he will be there for at least another two to three weeks. Because they are hours from home, Mikey is taking Family Medical Leave from work so they can be with Andy at the hospital, but that leaves an enormous need for the single-income family. Please take a moment to look through the auctions we will be running for the next several weeks, and bid on anything that strikes your fancy. On Friday, July 9th, Andy went home on Hospice care. Thank you all so much for your bids. It means more than words can say. Bills are still adding up from the Atwood’s stay away from home while Andy was in the PICU for two weeks, so all auction proceeds will continue to go directly to them to help lighten the financial burden. Thank you for sharing, they are in my prayers!